"The woman said, ‘You have my dog Cali?’ And then immediately broke down crying." A woman pulled into a rest stop to fill up on gas when she noticed a small crowd of people, all looking down at something. 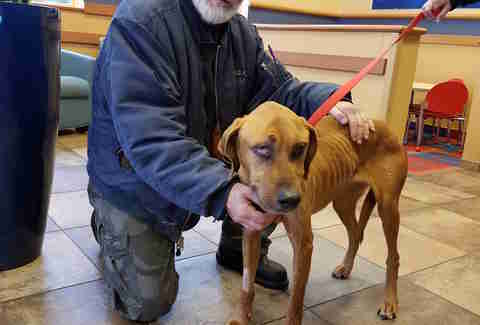 She got out of her car and went over to see what all the fuss was about — and discovered a dog, severely emaciated and desperately in need of help. The gas station attendant told the woman that the poor dog had staggered out of the woods and fell to the ground next to the gas station. He was just lying there, unable to move. The attendant said he’d been afraid to call for help because he wasn’t sure what would end up happening to the dog if he did. Luckily, the woman knew someone in animal rescue, and so she got in touch with Anita Innamorata-Stout of Broken Promises Animal Sanctuary. Innamorata-Stout and the other sanctuary staff members immediately agreed to take in the dog, and even offered to come and pick her up, but the woman said she would be happy to drive her to them. Before she started her journey, the kind gas station attendant gave her a free tank of gas and a small donation to help with the dog’s care, as thanks for helping save her life. As soon as the dog arrived in the rescue’s care, the staff knew it was going to be a long battle getting her healthy again. They quickly rushed her to their vet, Dr. Mary Kwacz of Mobile Vet MD, and started her on IV fluids immediately. Doctors drew blood to run some tests to get an idea of her overall health, and started her on antibiotics as she appeared to have some sort of infection. 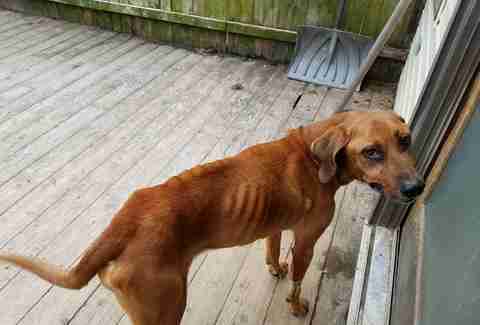 As a last step, they scanned her for a microchip, and were shocked when they heard the beep confirming that the poor dog had a family somewhere out there. They learned her name was Cali and she was 5 years old. Innamorata-Stout called the number listed on the chip several times before finally leaving a message saying they had Cali and to please call them back as soon as possible. Minutes later, she got a call back from Brittney DiBartolo, who couldn’t believe what she was hearing. “The woman said, ‘You have my dog Cali?’ And then immediately broke down crying,” Innamorata-Stout said. As it turned out, DiBartolo and her family had adopted Cali with another dog around the same age from a local shelter, and only had her for about a year before she went missing. 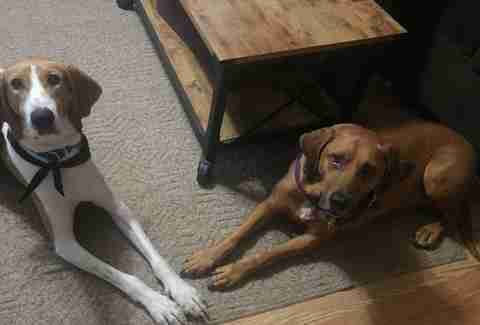 Both dogs were running around the family’s yard one day while DiBartolo was barbecuing, and when she called for the dogs to come in again, only one came back. Cali was a very loyal dog and never, ever left the yard without her family by her side, and so they assumed that someone had probably taken her. That was two years ago. DiBartolo and her family were so overjoyed to hear that Cali was alive, and couldn’t wait to make arrangements to come and get her. They had since moved to North Carolina, but were more than willing to drive up to New Jersey to be reunited with Cali. Everything seemed like it was falling into place — until Cali’s nose started gushing blood. 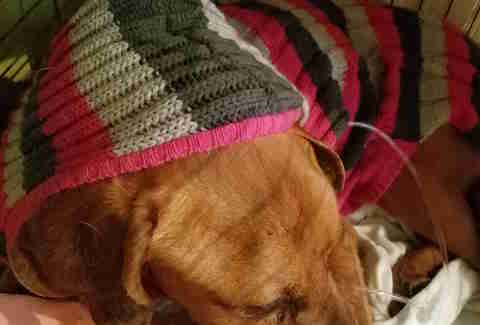 During her recovery, Cali had green and then light red discharge coming out of her nose, but her caretakers assumed it was from the infection she was being treated for. 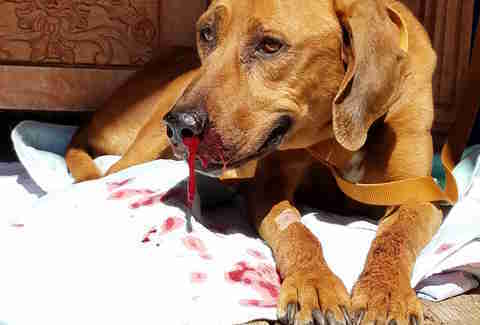 When she started bleeding, they rushed her to the vet, who didn’t have good news. 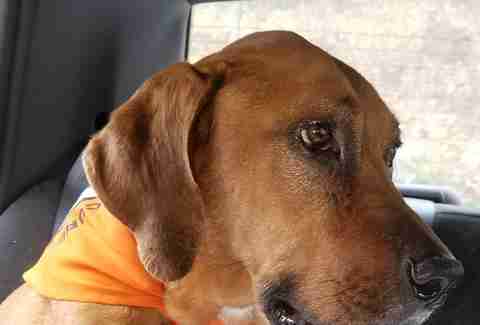 Cali had a large mass behind her eyes and in her nose, causing her to have trouble breathing and immense pain. After some tests, Cali was diagnosed with a cancer called adenocarcinoma, and without immediate treatment, her chances didn’t look good. The vet gave her a few days, maybe a week tops, and everyone was devastated — but they refused to give up hope that Cali could recover and still be reunited with her family. “I told Cali, ‘If you fight through this, I will get you home to your family,’” Innamorata-Stout said. Instead of standard treatment, the rescue began researching a special type of treatment through a program called Cyber Knife. After a lot of calls and planning, the rescue was able to get Cali into the program, and started her treatment as quickly as possible. After just a handful of treatments, Cali was already feeling so much better and she went from having a week to live to 10 to 18 months. She could even go on to live longer than that. 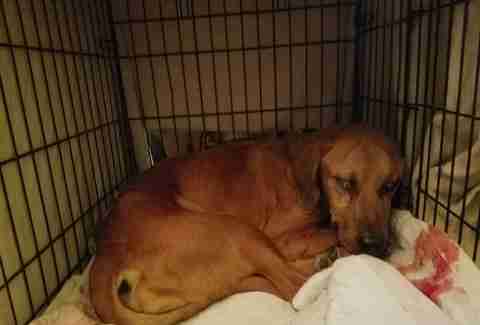 Now that she’s on the road to recovery, Cali’s family has made plans to come and pick her up in the beginning of June. They are so excited that they are going to see Cali again, and still can’t believe that she’s alive and coming home.